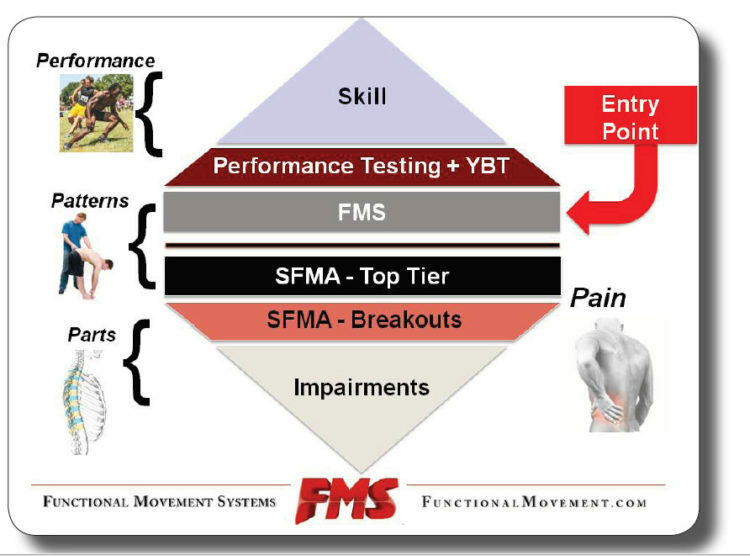 Lee Burton uses the FMS Performance Pyramid to demonstrate how the Functional Movement Screen and the SFMA work together to screen and assess movement when pain is present. What we set out to do back in the late 1990s came from looking at movement patterns and understanding we can’t just isolate certain areas. We’ve got to look at the whole system if we’re going to be successful. So, what did we do? During that same time, Gray published the Performance Pyramid. On top, you have skill testing. Performance testing is in the middle. Then, you have movement, or the FMS as the foundation. To this day, that’s one of the easiest representations I present to parents and to individuals who really don’t under­stand what we do. Movement is the baseline. “Before I get into anything else, let’s make sure you can do the basics first, without pain and without significant dysfunction. If you can, then let’s step over and push you a little bit harder.” That’s the goal. Set the baseline. Move on to a higher level and only then should you do specific testing for your sport. The one thing we didn’t do until here in the last few years is talk about the bottom area—the base. What happens when there is pain? What happens when there is a big issue? Consequently, we had to go in another direction—what we now call the Selective Functional Movement Assessment. The Functional Movement Screen is a screen by design. It’s not designed to tell you what the problem is. It’s designed to tell you there is a problem. The Selective Functional Movement Assessment is designed to tell you what the problem is. That’s the difference. We look at patterns first and then we break them down for the SFMA. If their patterns are good, let’s check performance—how well do those patterns work? That’s how we break it down, but our entry point is the Functional Movement Screen. What’s your current entry point for your clients and your athletes? What do they do when they walk in the door? Do you do a medical history? Do you check their blood pressure and pulse? Do you do the basics? If you’re going to do some movements, how do you check their movements? That’s the concept we’re trying to convey here.